Preparing for the U.S. Open, Johnson took the lead to himself with a par on No. 1, while Putnam double-bogeyed, and cruised to the $1.18 million winner’s check. 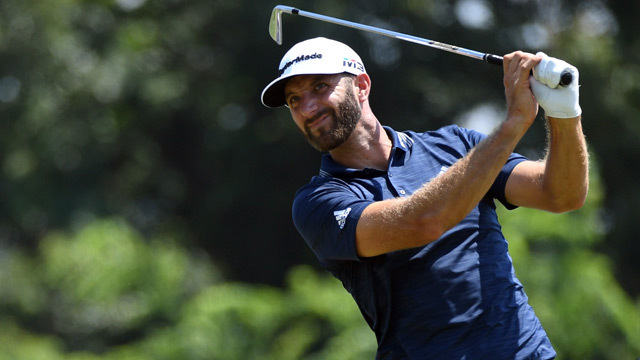 Johnson turned in the lowest score under par by a winner here since David Toms won at 20 under in 2003, and that was before the course was redesigned with par dropped from 71 to 70 after the 2004 tournament. Putnam, a two-time winner on the Web.com Tour, had only one bogey through his first three rounds. He pushed his opening tee shot into the right rough and his approach in the rough left of the green. He wound up three-putting for double bogey. Johnson rolled in a 4-footer for par and a two-stroke lead at 15 under on a sizzling day with the temperature feeling like 99. Johnson worked on keeping the ball in the fairway, hitting 3-wood off the tee on the first of the course’s two par 5s. Even with the 3-wood, Johnson had the second-longest drive of the day, hitting 333 yards on the 554-yard hole. Even when Johnson three-putt No. 5 to drop to 15 under, Putnam also bogeyed protecting Johnson’s lead at three strokes. Putnam pulled within two strokes with a birdie on No. 7, rolling a putt 11 feet after Johnson parred the hole. Johnson hit an iron 307 yards off the tee at No. 10. After hitting iron off the tee at No. 12 and going left of the cart path, Johnson saved par with a 16-foot putt to protect his two-stroke lead. Then Johnson hit a drive 359 yards on the par-4 No. 13, leaving him 95 yards to the pin. Johnson then hit his approach to 3 feet for his second birdie to go 16 under. He previewed his dramatic finish on the par-5 16th. Johnson’s tee shot found the trees right of the fairway, and he threaded a shot through a couple trees to just off the green. He chipped to 5 feet and birdied for a four-stroke lead.